Born in Zhivitov, in Kiev in the Ukraine, as Pinchas Segal, he attended Yeshiva there, and then went on to the conservatory where he studied piano and voice. In his early days he was a folk singer and, sponsored by the anti-religious Soviet government, and adopting the name Pierre Pinchik, he travelled around the country giving concerts. 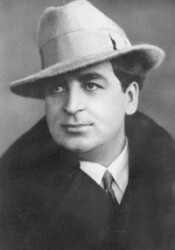 From 1923 to 1926 he served as Chazan to the Leningrad Shul, but without fanfare. In 1927 he went to America and, attracted by the freedom that was denied his fellow-countrymen under the Bolsheviks, he decided to remain there. It was not long before he was celebrated as both a Chazan and an outstanding performer of folk-songs, many of which he recorded. Pinchik was endowed with a very sweet and distinctive voice. It was not a 'great' voice in the traditional sense, but he had the unusual ability of singing everything with his heart. There is also an originality about his compositions that makes them immediately recognisable as his work. 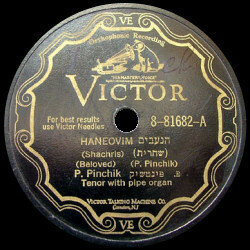 Unusually, Pinchik accompanied himself on the organ on some of his early recordings. Pinchik's most famous compositions are as fresh today as they were when he first introduced them to the public. His Ribono Shel Olom for Sefiras ho'Omer (with its recurring theme of Dee, da-da-da, Dee, da-da-da, Dee, da-da-da, Daa) and his Rozo D'Shabbos are perhaps, the most famous, and they are, without doubt, classic pieces. But there are others that are just as appealing. Areshes Sefoseinu, for Rosh Hashono and Hashem Hashem from Neiloh illustrate supremely well how he could interpolate the style of a folk-melody into Tefillah or, with the most uncomplicated Chazanut, rend your heart in two. I've heard it said that he was a very temperamental performer, even on the Bimah, and would refuse to conduct a service if there was the slightest sound coming from the congregation. He would wait until there was total silence before starting and would stop immediately if there was an interruption. Perhaps today's Chazanim could take a lesson from him! Although there are still fine Chazanim today, perhaps Pierre Pinchik represented the last of the Golden Age of Chazanim, the last true composer/performer who could pull in the crowds, whether to hear him lead a service or concertise. We are fortunate that a number of his recordings were made at a time when the technical ability to reproduce the voice accurately had improved enormously. Thanks to this, countless generations will still be able to thrill to this unique talent.